We want to take some time to answer some of your most popular questions here. Q: How much did it cost to build? 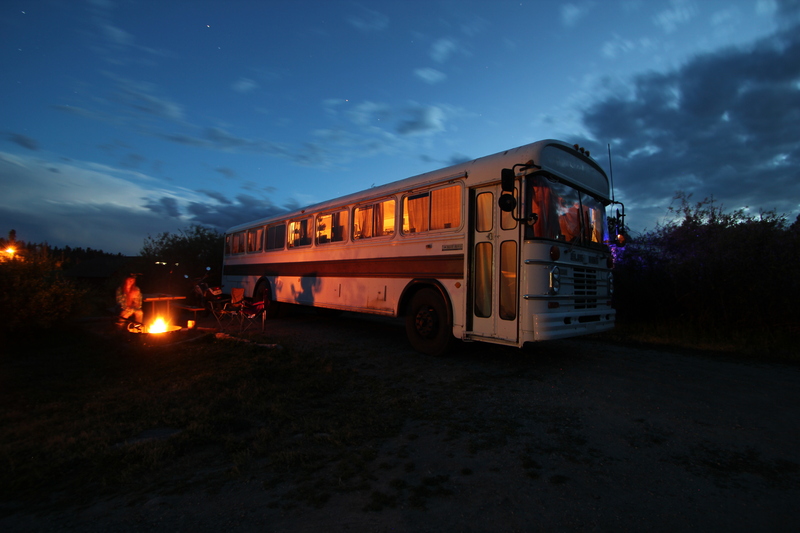 A: We bought the bus for $2000 and have another $6500 invested in the interior and mechanical repairs. This includes putting new tires on the back, repairing the water pump and doing general maintenance as well as building the interior and adding our appliances. We used a lot of reclaimed lumber for the project, which helped us save a lot of money. Q: Do you need a special license to drive it? A: No, we had the title changed from a commercial bus title to a motor home title, which allows anyone with a standard license to drive it. Q: Can you get insurance for it? A: Yes, but it took some work. We had to shop around for several days before we found a company that would insure a ”non-proffessional” bus conversion. Eventually State Farm did insure us as a motorhome. We have read other peoples stories and some have a difficult time insuring, while others get it easily and quickly from the first company they call. Q: What sort of fuel milage does that thing get? A: We have seen milage range from 7-11 MPG, which certainly isn’t economical but I consider it pretty good for a giant rolling apartment. If we drive around 55-60 MPH and there aren’t many hills we can usually get 10 pretty consistently. We have a 60 gallon diesel tank so we have a pretty decent range. Q: How do you find places to stay? A: We have several resources for figuring out where to stay, we usually look through Boondockers Welcome or Harvest Hosts to find a free parking spot for a night or two. We also have good luck using State Parks, they are usually pretty affordable and offer some nice amenities like hot showers. If there aren’t any better parking options we can usually find a Wal Mart or other large retailer to park at. We have also have good luck just parking along the curb in several different cities. Q: How can you afford to travel for so long without working? A: When we started planning the trip we already had some savings, we just continued to add to them from our paychecks. We also sold all of our cars, furniture, some electronics, and anything we didn’t want to use in our new tiny home or anything that wouldn’t fit. This has built up a decent savings account for us to live on for a few months while we travel. We will get back to work once we find somewhere to settle down for a while and begin the process of rebuilding our finances, but all the money spent on this trip so far is totally worth it. I consider it a small price to pay for the incredible experiences we have had and wonderful people we have met. Read more in this post. Q: What’s it like to drive? A: It is an awesome feeling to drive an old bus, with a view like no other. Looking out the giant windshield you can see the world stretching out before you. It is slow and loud but it has so much character you can’t help but love it. Watching the looks on other people faces as you rumble by is priceless. Fortunately there are so many mirrors hanging off the sides you can easily tell what is going on around you, although backing up onto busy roads or into tight campsites it is really nice to have Lindsey there to help out, she can run to the back and look out the windows and give me some more information. If you have more questions that we haven’t covered here please leave a comment and we will do our best to answer it! I’m working on a documentary film for a major cable network about the freedom of the American road. I’d love to talk to you about your story. Please email me at your soonest convenience at mt@warrior-poets.com. My name is Brooklyn Bagwell and I am Casting Producer for LOUD TV. I’m currently casting for a new show about innovative home designs for the FYI network. I was browsing through your website and would love to chat with you about this project. Please give me a call when you get a chance and we can discuss this in further detail. Seems to me I first heard of your bus adventures on Tiny House Blog belonging to Kent Griswold over in Bend. At any rate I stumbled across your old blog this morning as I was trying to find a photo of a Gillig bus conversion that my girlfriend and I had seen late last year just around the corner from us in Canby. Now for the questions… We’ve seen that same Gillig bus surface again closer to Canby recently, only to vanish just as quickly. Are you the owners, or simply know of the bus? Is it still for sale? Are you in the bus conversion and/or selling busses? We saw a teal Gillig bus for sale and posted it on Instagram back in the fall. I don’t have any more info on it. The seller’s contact info is on that instagram post, and there was a craigslist ad for it at that time. In what may or may not be related news, looks like someone who commented on our About page is working on a Gillig in Oregon right now! Good luck. Ran across your story somewhere on Facebook. GOOD ON YA! I’m always please to see young people getting out there and “doing it” instead of sitting around bitching about it. My wife and I have a 1990 BlueBird Wanderlodge that we hope to start wintering in Dec. 2015. In our past, we’ve live on our sailboat for 2 years and lived in Alaska for 3 years. Our bus is basically the same chassis as yours except we’re a rear engine. Congrats on the bus and the trip! These folks provide OUTSTANDING support and information on anything BlueBird. You can find part numbers and suppliers for parts you might not be able to find, advice on how to best resolve issues, etc.